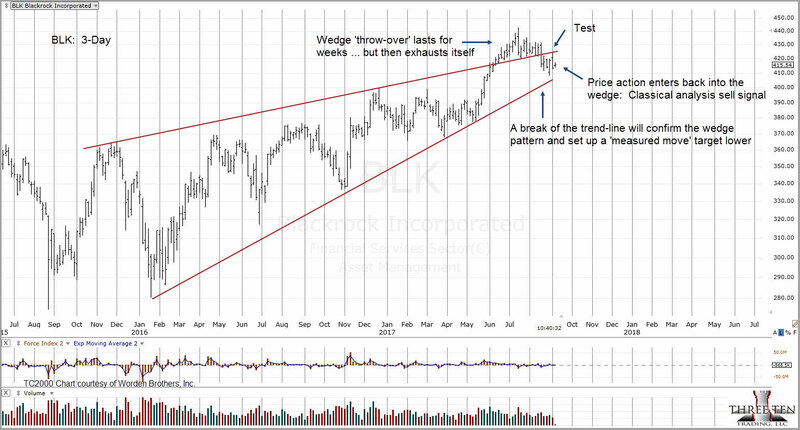 If we look at Blackrock on a 3-Day basis (above), the sell signal highlighted on the weekly becomes clear. Our short, humorous video on the final outcome for BLK may be closer to truth than anyone wants to admit. The stage has already been set long ago as Carl Ichan described. Liquidity in the bond market is nearly non-existent when compared to pre-Dodd Frank levels. If there’s a downdraft in bonds, a rise in rates with the ensuing mass sell-off, there’s another kink in the system; that is, ETFs generally don’t have enough cash on hand to deal with significant redemptions … they will have to sell the underlying assets (bonds) to meet withdrawals. With ETFs selling simultaneously (into an already declining market) it’s a self fulfilling wipe-out. We’ve already seen the effects of such an event as was witnessed on August 24th 2015. There were over 1,500 trading halts and ETF prices swung down far beyond their underlying asset values. Take a look at the video: “Stay the course”, “We’re in this together” Uh … no we’re not. My firm is constantly scanning the markets, looking for changes in price action ...shifts in power. We then positioning accordingly. We're always looking to position strategically (for the big move) if possible. It's a disciplined and focused process. If done right, we'll be in (or out) long before the press and pundits figure out the obvious and provide their 'expert' advice. Next time there’s a 1,000 point drop overnight or at the opening, the potential outcome is the market’s not coming back. Fundamentals can give an overall backdrop of conditions. What fundamentals can’t do is say “when”. When is the market ready to move? When will a reversal occur? When (and where) is the top or bottom? The charts provide probable clues to these events. They indicate when the likelihood of an event has come to the fore. 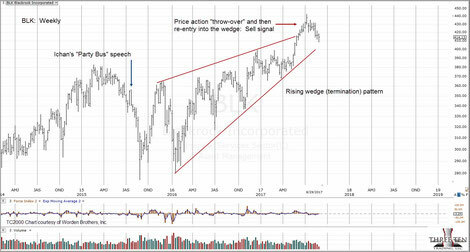 Now we see from the chart that BLK price action has created a rising wedge (termination) pattern, has thrown-over that wedge and then re-entered the trading range. All of these signals point to a long term top. If or when price action breaks below the lower trend-line, “going to hit a black rock” may come to pass quickly.